As Don Covay so rightly told us back in the seventies it's better to have and don't need than to need and don't have. Heart of Thorns proves the point and then some. It may be stuffed with features I don't need and won't use, like Raids and Fractals and Legendaries but along with those comes such urgency and excitement it's easy to forget I have no use for them. And anyway, as a thriver on chaos, I'm in my element right now. Yesterday, after months of nothing every day with more nothing for pudding, everything happened at once and I'm lovin' it. Headline news? What Jeromai said: "The jungle feels a lot better than I thought it would be". Not just the jungle. It all feels better. The UI changes, the Guild changes, the minion changes, the spell effect changes...so far the everything changes are rising stock. The whole game feels like someone took it into the yard, ran the hose over it, washed off the dust then buffed it up until it just shines. How much of this is New Car Smell? A lot most likely. Best enjoy it while it lasts. As a player it's overwhelming. More so as a blogger. I could have done half a dozen full-length blogs on different topics just from things that happened in my first session. Frustrating , having to choose first between playing and posting and second between what to cover and what to shelve for later. This will roll so fast what's front of the mind today will be familiar and forgotten in a few days. Most of it may never be covered, pushed out by new discoveries and concerns. So: bullet points while I remember them. Very smooth launch. Way, way above industry standard. So fast and stable that I was in-game five minutes after the announced time and was able to play for an hour before work with no issues. Since then game has been up, available and working non-stop. Just amazing. The issues people experienced through impatience were resolvable in-game. The streaming client has an option to prioritize specific content - click on the lower-right-hand corner and foreground the load you need. Easy to miss but works a treat. Beta was misleading. ANet kept telling us it was a real beta but they operated it like a marketing exercise. It failed badly as the latter but clearly worked effectively as the former. So far everything that concerned me in beta feels significantly less worrying now we're live. HoT is not that hard! Really, all the talk about challenge and some of the proof of that in beta, so off-putting at the time, is looking like just so much big talk now. Caveats: maybe it's the high numbers, maybe it's the class/build I chose for exploring (high heal/survival specced ranger over my beta glass cannon ele), maybe it's a little familiarity, maybe it's a low step to get in. Whatever, it feels much, much better. Verdant Brink is pleasantly explorable. Day or night. Mobs have been heavily thinned. 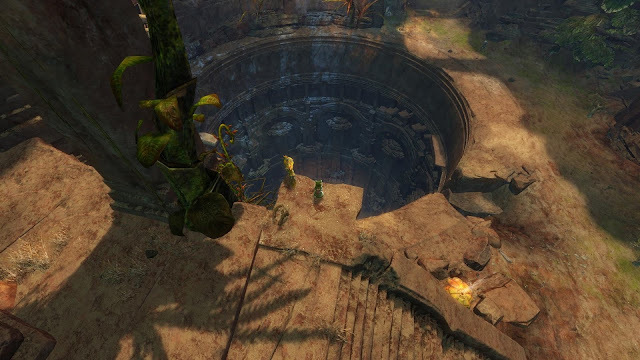 There are large areas where nothing wants to kill you and where it does it's as easy to sprint and dodge past without engaging as any other part of Tyria. Except those Mushroom Kings! Mushroom King! Why you so funny? How I wish I had a screenshot. Soon come. 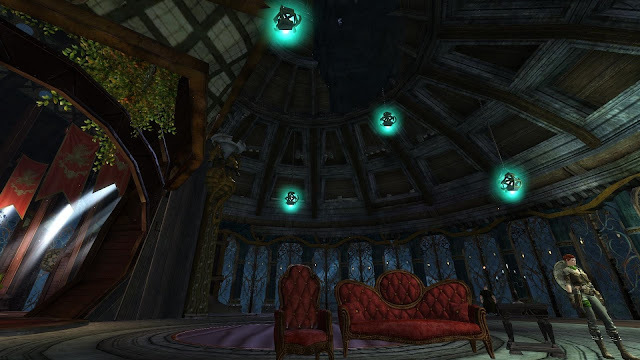 The Guild Initiative Headquarters is gorgeous! And my guild owns it! Well, no-one else can get in so same thing. Going to have a post about Guilds in HoT soonish I hope but just saying I'd take the GIH as a guild hall any day. Who needs a jungle ruin fixer-upper when you have your own four-storey mansion in the capital? My dog is bugged. In a good way! Well, I think he has to be, doesn't he? The long-awaited changes to minions, which includes ranger pets, that makes them all-but immune to AE fire not specifically targeted at them seems to have turned my Fern Hound into SuperTank. Seriously, he tanked everything in the Personal Story and in Verdant Brink without dropping under 97% health. I just stood back, plinked arrows and laughed. It's fantastic but surely it can't be intended behavior. If he can do that what could a bear do? Dog invulnerability notwithstanding so far everything seems remarkably bug-free. Events work. No-one seems to be yelling that stuff is broken. Unbelievable. Lots and lots of new stuff to grab. Dropped weapons, collects, recipes, new crafting mats. 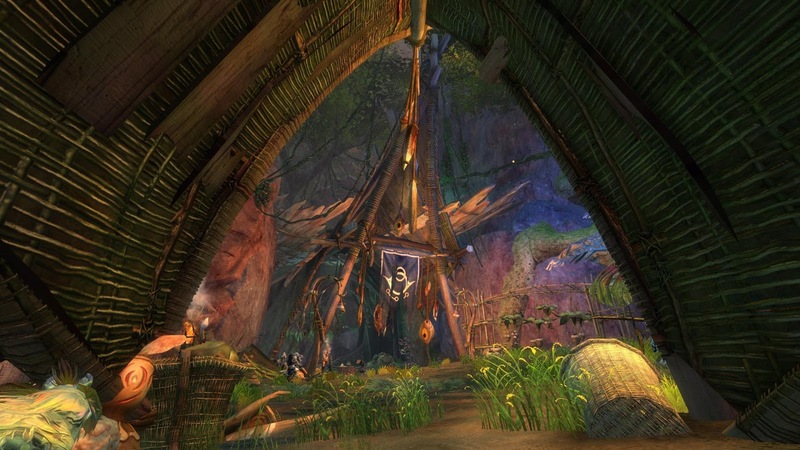 All the good stuff I want from an expansion that ANet mostly didn't bother to mention we were going to get. What is wrong with these people? Go read DBG's expansion promo material - if you have it, flaunt it, don't hide it. Surprises are totally overrated in this context. Everything changes and yet it stays stays the same. Lots of things I hoped/feared would vanish are still where they were, just wearing new clothes. Dailies, achievements, all the conveniences of Citadel in WvW...so far just about everything. My routines and habits scarcely need to alter at all. Is that a good thing? Feels like one. The new Citadels are Asuran built! Who knew? Well, everyone invited to the WvW closed beta I guess but none of them saw fit to mention it. So far I haven't set foot outside the Citadel to explore the new Desert Borderlands but if the Asura are in charge it has to be an improvement, doesn't it? The Great Spell Effect Reduction may have gone a tad too far. I get the motivation but I have everything on full that can be on full and I'm not seeing fireworks any more. I like fireworks. Sliders or options would be nice. There's more. So very much more. But that'll do for a first look. TL:DR is "Better Than Expected - Looking Good So Far". Well, that does all sound considerably better, but I'm still not buying in. I think I've simply lost too much steam with this one. Can't quite finger it. For now, I'm noodling around to see what I get for not buying, good and bad. Naturally, I've gone to the Borderlands. Asura designed citadels, yes! Y'know, given how many Asuran Dorito chips we've followed over the years, it seems about time there was a change in contractors, eh? Well, the only real action I've gotten so far is getting killed by a swarm of JQ. Nothing revealing in that. I think I might have linked the New York Dolls clip before. It's neither a particularly good performance or one of their best numbers but for appropriateness here it can't be faulted. I don't think I'd encourage any lapsed GW2 players to come back just for HoT. It's not like it's going to change anyone's mind if they'd lost patience or interest with the game as it was. 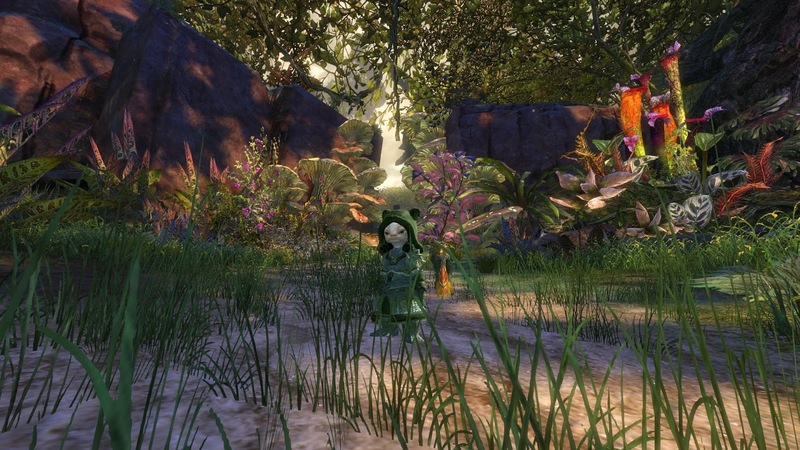 I would say, though, that it's worth taking another look for anyone who still feels they might like to play some more GW2 but thought HoT was going way off in the wrong direction. I'm very surprised, and pleased, by how much closer to the original it comes than I expected. Or at least the original as it had become circa the end of LS1 anyway. Now I'd like a release date for Thalumbra please. City of Heroes: It's Kind of Back!